Lizzie launched Chakra Dancing in 2001 and the practical Diploma in Chakra Dancing in 2005. 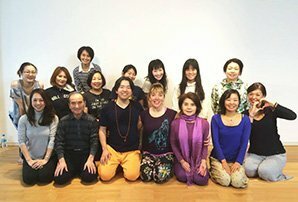 This spiritual dance practice has quietly grown and public demand for classes, workshops, 1on1 training and study has increased. 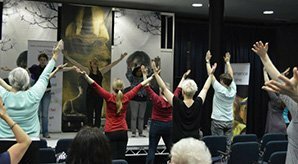 Lizzie is passionate about sharing the benefits of healing the body through movement, dance and creative meditation to students on the practical retreat training courses she runs with Gina in the UK. Today many people are following their heart’s desire and purpose in life to share this cathartic healing practice as part of their healing tool kit to others. You may be a complementary therapist, Reiki or spiritual teacher, sound therapist, teach Yoga/Pilates or you may simply want to indulge in your own spiritual growth and empowerment and use the five day practical training (module one) as a spiritual retreat just for you. There is something for everyone on this course. Lizzie’s passion and love of music has inspired her to create music that resonates with the chakras. Lizzie has collaborated with some of our most gifted musicians of this age, producers and techno wizards from the music industry. October 2002 saw the launch of Chakra Dancing 1, popular with all age groups and genres, now in its fourth print run public demand has grown for more chakra music and Chakra Dancing 2 and 3 have been very well received. 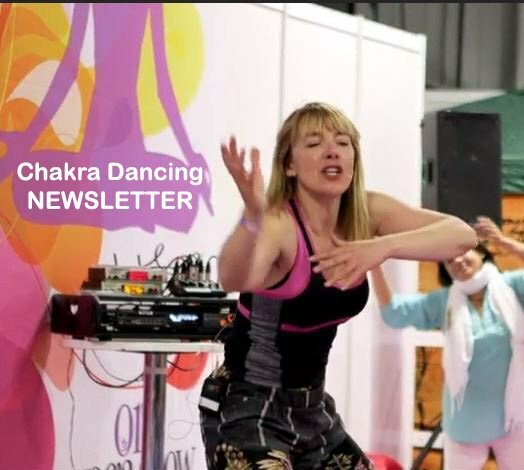 Summer 2015 sees the launch of Chakra Dancing 4. As we evolve so does the music and the commitment, dedication and love shines through this new CD as we embrace change and create the life we truly desire. Meditation CDs include Journey through the Chakras, Tibetan Soul Journey, Animal Whispers and six further instrumental meditation CDs have since been launched to international acclaim. Lizzie regularly performs Chakra Dancing and Creative meditations at the international London Mind Body Soul, Yoga Show, Mind Body Spirit and the Medicine Musical Festivals and also teaches in Tokyo and Johannesburg. To celebrate World Yoga Day Lizzie appeared on BBC 1 Bend it like Britain demonstrating Chakra Dancing at the Yoga Show Manchester. Lizzie’s ongoing training for herself continues and delights in sharing these experiences with her students. Students are able to play and practice with a large collection of gongs, percussion instruments, crystal bowls and chimes at Chealsfield. Students are encouraged to express their unique gifts and creative passions. Lizzie is most grateful to mentors and teachers such as Don Conreaux, Aidan McIntyre, Livia Barbosa, Tim Wheater and Sheila Whittaker and many more who help shape our creativity for the better and love of life! Lizzie facilitates creative meditation workshops and classes and uses a range of instruments such as the solfeggio chimes, wah wah bars, Tibetan and crystal bowls. Having qualified in the Diploma in Sound with The Wheater Sound Academy, Lizzie teamed up with friend and mentor Tim Wheater and co created Animal Whispers, an instrumental piece of music with flutes, wah wahs, chimes and violins: creating rich textures and sounds. Lizzie loves to use natural sounds from nature in her guided meditations to reconnect with our natural world. Gina is Lizzie’s full time assistant on all the Diploma courses. She is a professional complementary therapist specialising in energy healing and massage. Originally Gina trained at the London Centre for Theatre Studies and Alternative Drama School (ADS). Here she excelled in her love of dancing, speech and drama and comedy. She has performed on stage with Lizzie, in theatre and on TV and in film. She is passionate about Chaka Dancing, creative meditation and generally dancing to great music. She plays the drums and percussion and fundraises for animals worldwide.